Oder lösen Sie dafür 2800 Kobo Super Points ein! Welcome to Funkland World where everyone is possible! 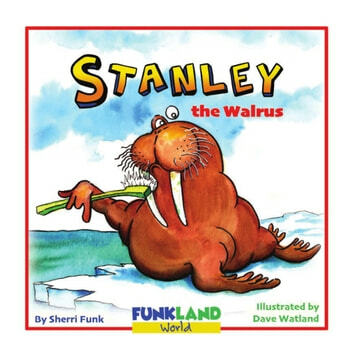 In this book you will meet a very friendly and somewhat stinky walrus named Stanley. Everyone who knows Stanley loves him and would like to get to know him better. But there’s just one problem ~ Stanley’s lacking in hygiene! The townspeople, including lovely Stella the walrus, are honest with Stanley and tell him what will help. Read along to see what Stanley does and how it changes his life. You never know, it might change your life too! Stanley the Walrus is also a song. Find the link inside and you can sing along with the book. Thank you for visiting Funkland World. Come back soon! While the story was almost lyrical, it swung a little wide for me. It's the story of a walrus with bad hygiene. He meets a lady walrus and wants to get to know her better, but alas, he stinks. He gets all cleaned up and *spoiler* they marry, with a polar bear as the minister. The story states that the union is built on love and trust, but really, isn't it built on cleanliness? She didn't want to have anything to do with him before he brushed and bathed... What about if he has an off month and cleanliness isn't a priority? Is she going to continue to love poor Stanley? Obviously I am overanalyzing the story, but it's a question that rose in my mind! The pictures were great!